Can you believe this? 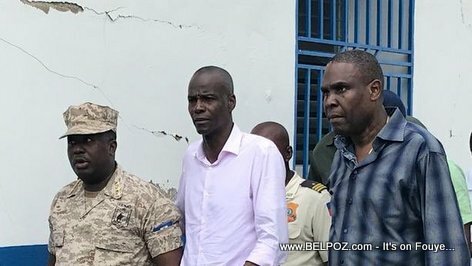 Haitian president Jovenel Moise's security guards ran like hell and left the president to fend for himself inside a concrete building when the earth started shaking Sunday in Gros-Morne. That's right... At the moment of the 5.2 magnitude quake Sunday afternoon, President was inside a building with a concrete roof in Gros-Morne, the Centre de Lecture et d'Animation Culturelle (CLAS) meeting members of the Gros-Morne civil society. As soon as they felt the goudougoudou, security agents, ministres, everybody fled the premises, abandoning President Jovenel Moise AND prime minister Jean Henry Ceant by themselves, Radio SCOOP FM reported. WOW... What brave men president Jovenel Moise has guarding him! And who told the president and his delegation to enter a concrete building for a meeting in an area that just had an earthquake? It is funny a little bit but serious at the same time. We can understand a human reaction when facing life and death situation. The president did the right thing by not letting the situation deviate him from his duty as president. He should call a meeting his his security team, and speak with them about their duties as Presidential Security Agents.